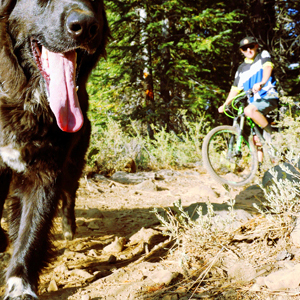 Fall is one of the best times to hit the trails in the Tahoe area. The Aspens are golden, the air is cooler, and the crowds are fewer. No matter your skill level, there's a trail for you. Before the snow hits check out these rides. The Flume Trail is a 21-mile loop route of mostly single track trail. It offers some of the best views of Lake Tahoe, as well as, the Spooner Lake and Marlette Lake areas. There are a couple of tough spots, but for the most part, it is a moderate ride. Some of the paths are narrow with steep cliff edges making this an exhilarating ride. 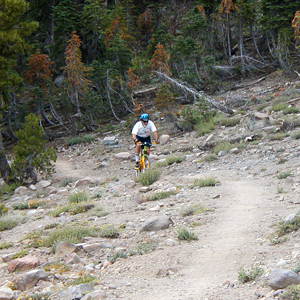 This 15-mile, single track trail is one of Truckee’s most popular rides with easy terrain and beautiful meadow views. It’s an out and back trail that starts out at the Donner Camp Picnic Area and takes you through open forest with moderate climbs and downhills perfect for cruising to Stampede Reservoir. 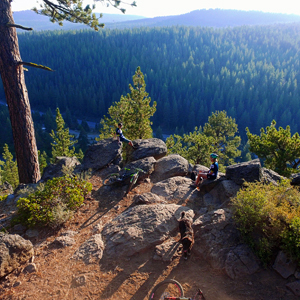 This roughly 15-mile loop starts in Tahoe City and heads north through the forest on a ride that incorporates long, difficult climbs and moderately rocky descents. 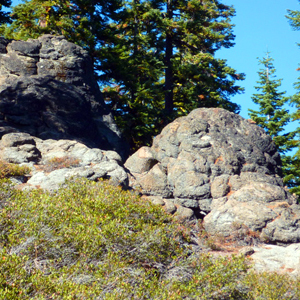 The climb rewards you with some of the best views of Lake Tahoe, Castle Peak, and Squaw Valley. Click here for more info on how to find the trail. To get a gorgeous dose of fall colors and alpine scenery paired with an easy to moderate ride, head to Euer Valley. 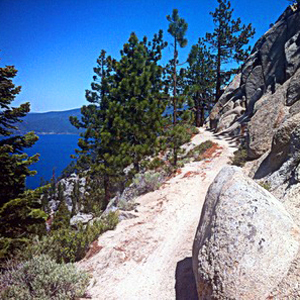 Its part of the over 60 miles of trails and forest service roads in the Tahoe Donner trail system. As you wind through these multi-use trails you will encounter wildlife, easy terrain, and a mix of forest and valley tracks. 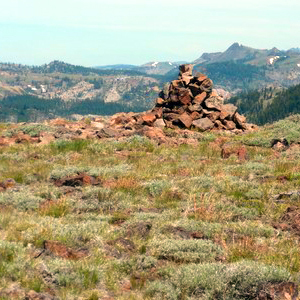 The Stanford Rock Loop is 14 miles of mostly single track trail. It’s a long, tough climb in spots followed by a series of technical rock steps, however, you will be swept away by the views of Twin Peaks and the Sierra Crest. When the snow isn’t covering this ski resort, it’s a mountain biking playground with over 125 miles of trails and two chairlifts for easy trips up the mountain. 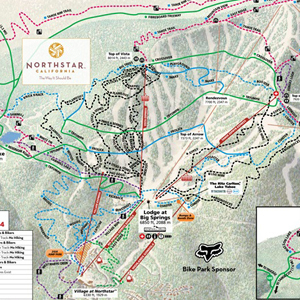 Northstar offers everything from easy going trails for the beginner and rock gardens, big drops, and berms for the more advanced. They also offer a wide array of rental equipment. 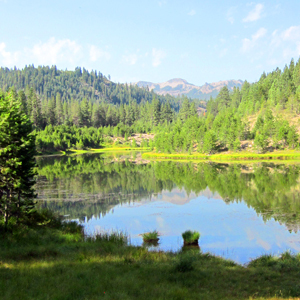 Burton Creek State Park is a 2,000-acre undeveloped park located near Tahoe City with miles of bike trails that wind through meadows and climb to scenic vistas. 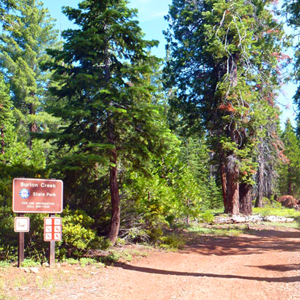 The trail system throughout the park ties into several other popular routes, including the Tahoe Rim Trail and the Fiberboard Freeway. You can enter onto the trail system in a variety of different locations, but the easiest spot is at the Tahoe Cross-Country Lodge. This 8-mile single track loop trail has some moderately difficult rock gardens, but is a gentle rolling ride for the most part. 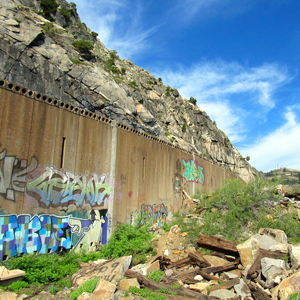 It runs high above the Truckee River with amazing sweeping views of the canyon below. This an easy and very unique ride through different segments of tunnels with openings along the roughly 10-mile trail that offer gorgeous views of Donner Lake. Graffiti adorned walls make this ride one-of-a-kind. Be sure to bring some light as parts of the tunnels can get pretty dark. The Coldstream Canyon bike trail is a mix of steep singletracks and 4-wheel drive roads tucked into gorgeous scenery. You have two options on this moderate climb on to Tinker Knob. You can stick with the 8-mile one way trip or turn your route into a 19-mile loop by staying on the 4-wheel drive road you passed near the summit northeast down the mountain till you join Jackass Point Rd, north to Truckee, and then back to Donner State Memorial Park. This is a tough and challenging, but fun 16-mile loop with a mix of single track, dirt service roads, and paved roads. Challenging climbs, flowing and technical downhills, rocky sections and breathtaking views of the Sierras make this an enjoyable fall ride.